​Thanks to your hard work in the garden and orchards in the past eight years, over 25 tons of fresh produce has been donated to hunger relief agencies in Mesa County. Big changes are coming. 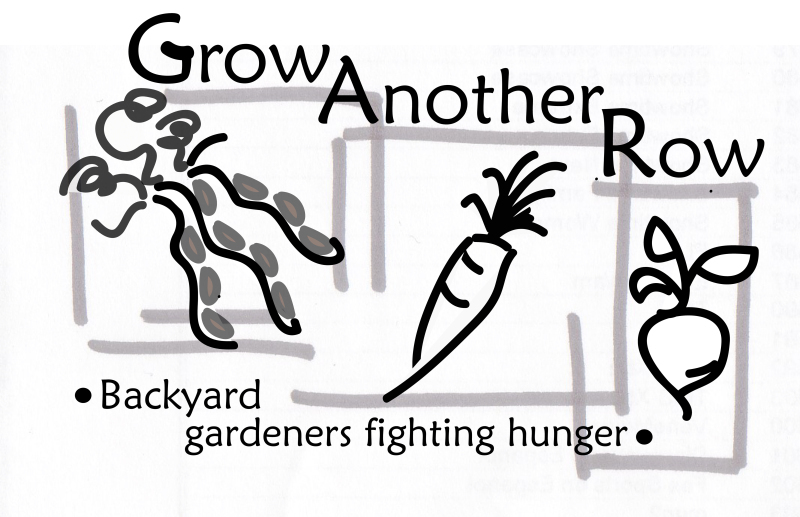 Grow Another Row has joined the Community Alliance for Education and Hunger Relief (Community Alliance) and through this partnership, we anticipate growing, harvesting, and donating approximately 40 tons of fruit and vegetables to hunger relief in the 2017 growing season. Grow Another Row will still exist and has an important role in the Community Alliance, and you can play a vital role too. Nutrition education to help support and encourage a healthy lifestyle. Volunteer • Volunteer opportunities abound. We are looking for individuals, community groups, employee groups, social groups, religious organizations, and schools to participate in our community harvests. Past experiences have shown that volunteers can safely and efficiently harvest fruit without ladders, and we always send volunteers home with fruit. We will also need volunteers to help in our vegetable harvests. Finally, we need volunteers to make small-scale deliveries of fruits and vegetables to hunger relief agencies. Donate • We have never before asked for financial support, but delivering nine acres of fruit and growing 9 acres of vegetables is going to require money. We are busy applying for grants, and donations from the community would go a long way to show local support and trust in these projects. All donations are tax-deductible. Checks can be made payable to the CSU Foundation with a reference to the Community Alliance in the memo line. They can be sent to Community Alliance for Education and Hunger Relief • c/o Western Colorado Research Center • 3168 B ½ Rd • Grand Junction, Colorado 81503. Grow • We still want your backyard produce! It provides a wonderful diversity of fresh vegetables and fruit that hunger relief agencies value. We can pick it up or you can drop it off at our collection points. You can see the Grow Another Row website for details. Participate • Are your children in clubs, troops, youth groups or home-school co-ops that would like to participate in the educational activities at the Research Station? We are creating opportunities to get kids outside this summer and fall to learn about gardening, horticulture, insects, water-use, and civic service. Bring your kids into our orchards to harvest fruit and then go to the Food Bank of the Rockies to help turn that fruit into fruit leather for the Kids Aid Backpack Program. We welcome your ideas and want to make the Research Station an outdoor classroom to be used by the community. If you are interested in volunteering or participating in these programs, you can contact me at at growanotherrow@gmail.com or amanda.mcquade@colostate.edu or at 970-462-2113. For more information on the Community Alliance and its activities, you can visit the Grow Another Row website or http://aes-wcrc.agsci.colostate.edu/community-alliance. We are developing a Community Alliance facebook page containing updates on our most recent activities. Thank you for all your support and I look forward to growing great things together in the future! The idea is simple. When a hobby gardener or commercial grower has surplus vegetables and fruits, they call us. 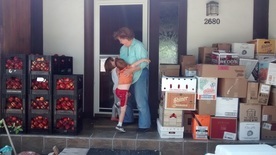 We pick up the produce and deliver it to food banks and emergency food programs in Mesa County, Colorado. We have donated 52,316 pounds of fresh produce in eight years. Why go through us? Well, we always encourage gardeners to make the donations directly to the food banks and programs they support. It is a pleasure to meet the hard-working people that help people in Mesa County. Grow Another Row just makes it a little easier to make that donation. We have also learned over the years which food banks and programs can take huge amounts of produce or use the less mainstream vegetables like beets, kale, or habaneros. If you would like to participate in Grow Another Row or if you have any questions, please email us through our contact form.